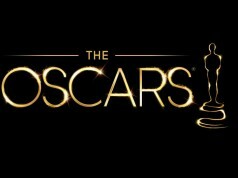 For the next three months, cinephiles should leave Friday nights open for Eckerd College’s International Cinema Series, where the slate of free movies on the main campus seem to get better every year. The Act of Killing, Joshua Oppenheimer’s new documentary as difficult to forget as it is to describe, started off the trimester this past weekend, and the Fall Semester’s schedule reads like a film festival from Cannes or New York. Drug Wars from Chinese director Johnnie To is next up on Sep. 13, and Aleksandr Sokurov’s Faust, 2012, a Golden Bear winner from Venice’s Film Festival and Carlos Reygadas’s Post Tenebras Lux, 2012, are but a few of the lineup’s highlights. 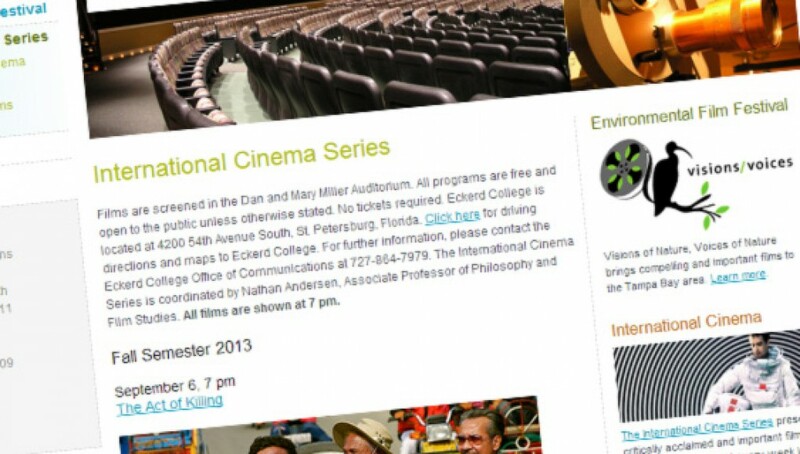 Nathan Andersen, Associate Professor of Philosophy and Film Studies, began this series in 2003 at Eckerd’s St. Petersburg campus, and the films shown in the Dan and Mary Miller Auditorium are a great adjunct to the students’ curriculum as well as a cultural offering to the surrounding community. An exciting addition to this year’s schedule is a retrospective of the Japanese filmmaker Shohei Imamura. Andersen, together with Dr. Eileen Mikals-Adachi, the college’s Associate Professor of Japanese, has scheduled a month’s worth of Imamura’s rarely-see films, all presented in their original 35mm print, and it all starts on Nov. 1 with Stolen Desire, 1958. 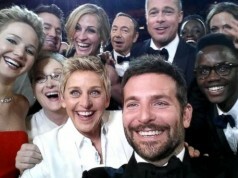 No tickets are ever needed, and there is no better way to spend a Friday night. 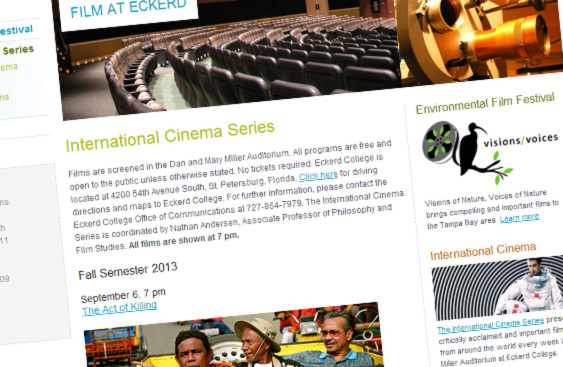 Visit the website http://www.eckerd.edu/film/ics/ for details, and stay tuned for Spring Semester 2014.